DM Tiling - Why Choose Us? The principle driver of our business is our customer focus, and delivering a quality end result, within the time frame specified at a competitive price. We aim, wherever possible to not only match our customers’ expectations, but to exceed them. So why choose DM Tiling? For our commercial tiling service we can, and do, travel throughout the UK for our customers. Our staff are CSCS (Construction Skills Certification Scheme) card compliant, so have passed the practical skills tests to ensure quality workmanship. 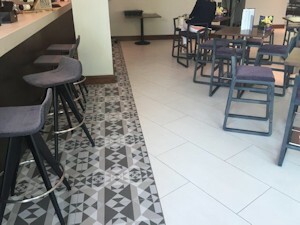 We are recognised as the ‘go to’ tiling company for commercial work where speed of turnaround of tiling work is critical whilst maintaining first class quality and finish. Equally, such is our customer focus that we will work overnight for our customers or over the weekend, to ensure that work is completed to the customers timeframe. We have the organisation flexibility that allows us to do this. Where a customer might have a change of requirement or circumstances, we simply adapt to those new requirements. We also recognise that sometimes we have to work in commercial and domestic circumstances where we work around customers in situ. We provide competitive rates for the work that we do, whether it’s domestic or commercial. All our work conforms to British Standards which guarantees a high quality of workmanship – workmanship that will stand the test of time. It goes without saying that behind our company growth we have the foundation stones of reliability and professionalism in place. This means, for example, that when we complete domestic work, we make sure that when we leave a customers’ house it is just as tidy and clean as when we first arrived.